ASHTABULA COUNTY - For the last two years, law-enforcement officers have spent a spring weekend bonding with minority children during a Kids and Cops Campout, with an aim of creating positive relationships with the children. 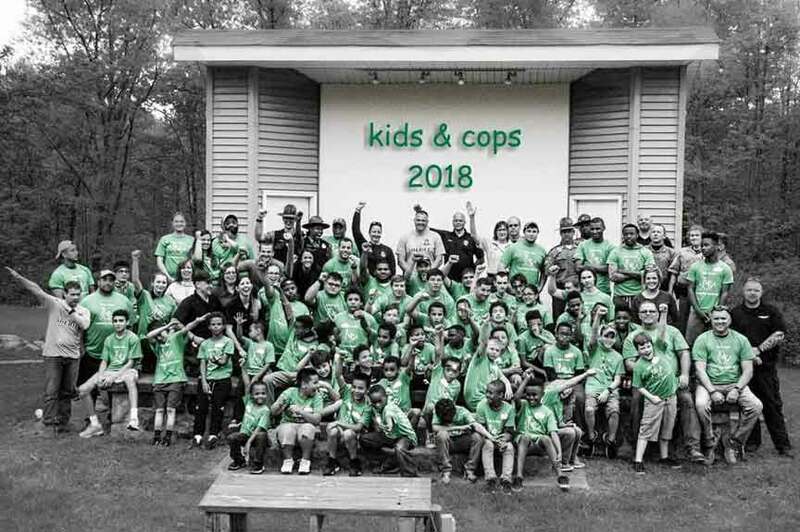 The 2019 Kids and Cops Campout is planned for kids primarily ages 8-11 in a minority population on May 17-19 at Pymatuning State Park in Andover. The Kids and Cops Campout was the brain child of Det. Greg Leonhard with the TAG Law Enforcement Task Force. Leonhard said the idea came to him as he was walking at Pymatuning State Park in the fall and thinking about issues between cops and the minority population that have been in the news. “I, myself, feel God put it in my heart,” Leonhard said of the idea for the campout. Leonhard had the idea of the kids, who may never venture out of the city, coming out to the park and enjoying outdoor activities while being given an opportunity to speak with the officers and ask questions of them. Leonhard called Ashtabula County Prosecutor Nicholas Iarroci about the idea, and Iarroci encouraged him to pursue it further. As part of the campout, the children spend the weekend fishing, learning archery, canoeing, competing in a team-obstacle course, roasting hot dogs on a camp fire, riding in a pontoon boat, feeding the fish at the Linesville Spillway and, of course, camping in the great outdoors. “It’s primarily directed to minority children to try and improve their relations with law enforcement,” Leonhard said. With two years now under their belt, Leonhard said they’ve acquired a lot of stuff... stuff that needs storing. Leonhard said they are looking for a 20-foot or so trailer to haul the items for the weekend and store them for the rest of the year. While the Kids and Cops Campout has received many donations from businesses and community members, Leonhard said he doesn’t want to use too much money that’s meant to go toward the kids for that weekend. Instead, he’s looking for someone, such as a business or perhaps two businesses that go in together to donate a trailer. The idea is to put a Kids and Cops Campout logo on one side, and the logo for the business that donates the trailer on the other side. If there is someone interested in making the donation, they may call TAG at 330675-7890 or the Ashtabula County Sheriff’s Department at 440-576-0055 and ask for Leonhard. They may also reach out to Steve Sargent from the Samaritan House (440992-3178) or Officer Chris Cahill from the Geneva Police Department (440-466-1111). After the first of the year, Leonhard said they’ll begin looking at picking kids for next year’s campout. There will be 20 kids from Ashtabula County and 20 kids from Trumbull County. Trumbull Family Fitness, which used to be the YMCA in Warren, will handle coming up with 20 kids from there. The United Way of Trumbull County is also awarding a grant. Sargent, Sally Bradley from Lakeside High School, and Pastor German Womack will help select the kids in Ashtabula County. But if people have a child in mind who may be a good fit for the camp, they may contact any of the people listed above. For this year’s camp, Leonhard said they experienced a heavy rain storm one night, which had some of the kids wanting to go home. During his short service on Sunday morning, Sargent used that experience to tell the kids a valuable lesson. “‘What you experienced last night, I deal with people who live that experience. It’s not just one night,’” Leonhard said Sargent told them. The kids and people involved both leave with a good experience, Leonhard said. People wishing to learn more can visit the Kids and Cops Campout Facebook page at www.facebook.com/KCCampout/. Nearly 40 kids attended the 2018 Kids and Cops Campout.